Every staff team comes with its own linked OneNote Staff Notebook. Your Staff Notebook is a digital notebook that cultivates educator collaboration at the school and district levels. Staff Member Notebooks -- a private space shared only with the staff leader and staff members. Professional development, lesson plans, classroom observations, evaluations and parent communication are among the possibilities. Content Library -- a read-only space for storing information on policy, procedure, school planning and more. Collaboration Space -- where multiple staff members can share, organize, and collaborate, from lesson plans and meeting notes to department-wide initiatives. If you haven’t set up your Staff Notebook yet, you’ll be guided through the right steps the first time you visit the OneNote tab. Navigate to a class team, then select the General channel. Select the Staff Notebook tab. 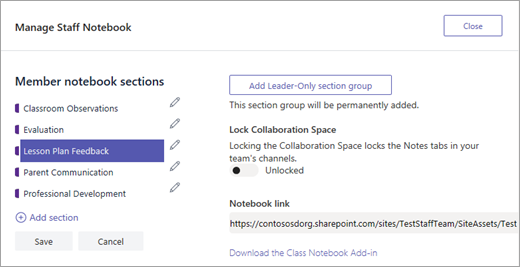 Each time you create a new channel in the class, a new section is automatically created in the Staff Notebook’s Collaboration Space. Staff leaders and staff members can edit and work on OneNote pages within a channel. Navigate to a class team then select a channel. Expand the Staff Notebook tab to a bigger size by selecting the Expansion icon (diagonal, double sided arrow). Manage your Staff Notebook settings by navigating to your notebook in Teams, then selecting the Staff Notebook tab > Manage Notebooks. Select Open in OneNote to launch into OneNote and access all of Staff Notebook’s learning features.